As mentioned before, I spent a couple of days with a film crew shooting the footage for the host city profiles for FIFA. The footage will be shown before the matches are played during the FIFA 2010 World Cup here in South Africa. This means that the footage shot here in Port Elizabeth gets aired just before the games that is played in PE. We are fortunate that there are eight games here, so lets hope it involves some high profile teams so that the city gets maximum exposure from the footage. 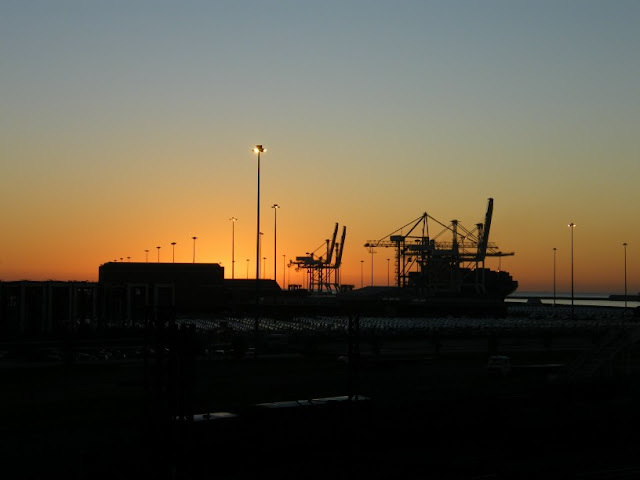 Port Elizabeth is often tagged as the water sport capital of Africa due to the wide variety of water sports that can be participated in in the Bay. 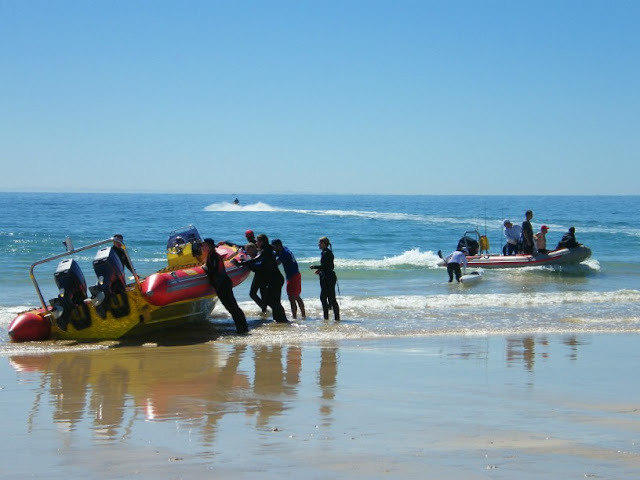 Algoa Bay offers perfect sailing conditions all year around while paddling, scuba diving, surfing, kite surfing, and many other water sports are also popular. Here in one photo there are four different water based sports being participated in. On the left there are scuba divers getting ready to go out, in the back is a wave skier, there is a paddler going in and a rubber duck with some recreational fishermen coming ashore. I was very fortunate to spend some time with a film crew shooting footage for the FIFA host city profiles to be broadcasted during 2010 recently. I did have to get up really early a couple of mornings as the guys wanted to get various good sunrise locations. This specific morning we were standing on the Settlers Freeway looking out over the harbour at sunrise. I posted a couple of similar shots I took from here a few of days ago on The Firefly Photo Files which can be seen here. 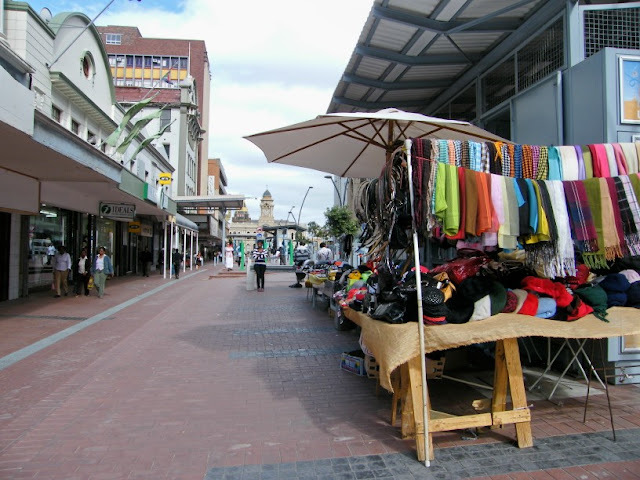 About a year or so ago the municipality had the top section of Govan Mbeki Road (previously Main Street) up to the City Hall developed into a pedestrian walkway with stalls and space for street traders to work from. The actual street is now a one lane one way towards the City Hall just behind the traders (towards the right hand side of the photo). A lot of the stalls are still empty, but there is loads of potential for the area to become not just a market for locals, but also for tourists visiting the historic heart of the city. Following yesterday's post on the Penguin Plod I decided to post another pic from the Plod. Yesterday's was from the last section of the walk strolling (or plodding) along the beach. Today's picture was taken not too long after the start of the Plod as people were heading down towards the Cape Recife Lighthouse through the nature reserve. 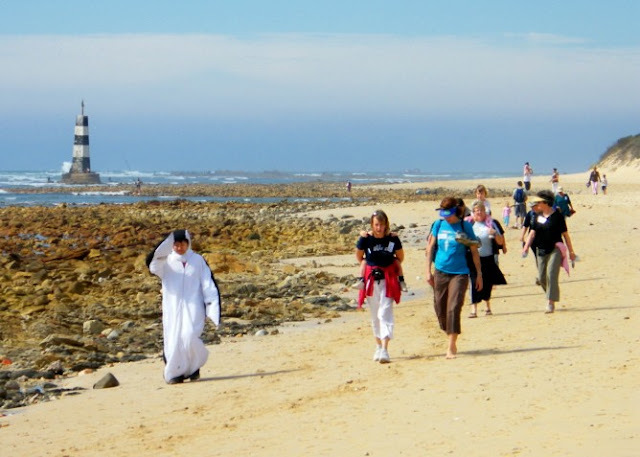 Yesterday we headed down to Cape Recife Nature Reserve for SAMREC's Penguin Plod. SAMREC is the newly opened South African Marine Rehabilitation Centre which I did a post about a week or so ago on The Firefly Photo Files. The Penguin Plod is a fun run / walk which SAMREC hopes will become an annual event and acts as a fundraiser for the centre. Judging at the response they had as well as the uniqueness of the fun walk, it will definitively happen again. 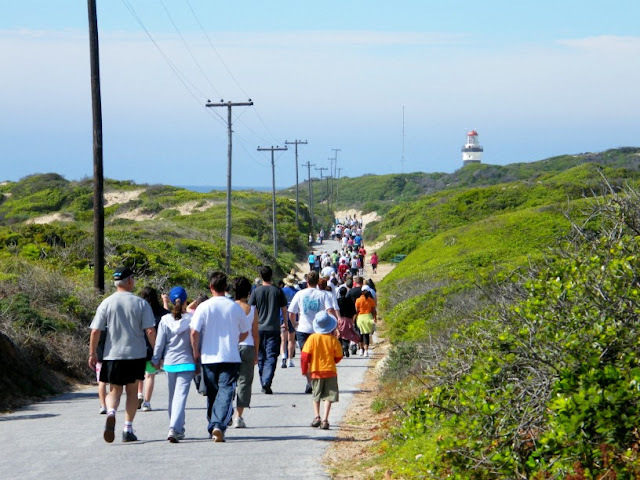 The fun walk started at the SAMREC centre and headed two kilometers down the road to the Cape Recife Lighthouse. It took the participants past some of the interesting and indigenous vegetation that the reserve has to offer. After a big circle around the lighthouse and a quick sip of water, it was back to the centre, this time walking on the beach. This bit probably took everybody twice as long as the walk to the lighthouse as the kids kept on exploring and picking up stuff on the beach. The one young lady did the whole walk in a penguin suit as you can see in the pic. We will be back next year, for sure. As Boing pointed out in her comment on yesterday's Heritage Day post, today is also Braai Day. 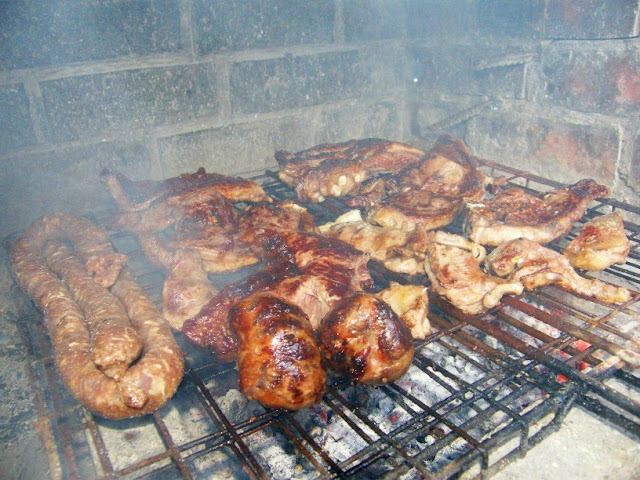 A braai (or barbeque) is a traditional South African pastime. It is so part of South Africans that some group decided to celebrate Braai Day on Heritage Day as it is a intricate part of our heritage. So to celebrate Braai Day, we braai'd this afternoon. And went all out. Hey, whats the use celebrating something half hearted? So from left to right: Boerewors (farmer style sausage), Skilpaatjies (or Karoo Oysters, which is minced lamb's liver wrapped in fat), Sirloin steak, Lamb chops, Lamb ribs and pieces of Lamb flank. The Braai broodjie (toasted sandwich made on the coals with tomato, onion, cheese and chutney) followed as soon as the meat came off. I am stuffed with left overs for tomorrow. Tomorrow (or today, depending on when you read this), 24 September, is Heritage Day here in South Africa. Heritage Day is a Public Holiday on which South Africans across the spectrum are encouraged to celebrate their cultural heritage and the diversity of their beliefs and traditions, in the wider context of a nation that belongs to all its people. Here in Port Elizabeth there will be several Heritage Day celebrations with onr of the main ones being a "Save our City" campaign driven by the Nelson Mandela Bay Tourist Guides Association. Activities will start at the Donkin Reserve after which a guides walk will be done past some of the heritage sites in the area. 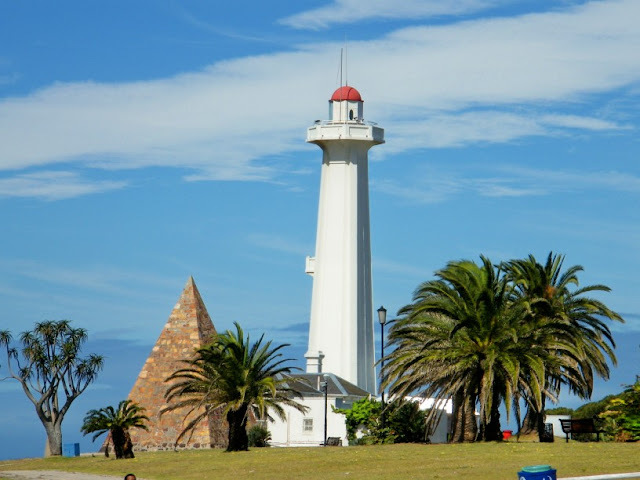 The Donkin Reserve with the Lighthouse (1861) and Pyramid (1820) is very much part of Port Elizabeth's heritage in that the pyramid is a monument in memory of Lady Elizabeth Donkin after which the city was named. So whatever you do tomorrow, don't forget to celebrate your heritage. The big "LOVE THIS PLACE" banner went up on the side of Brister House in the city centre a little while ago and I think it's awesome. Brister House is one of the Nelson Mandela Bay Municipality's main office buildings and is one of the highest buildings in town. 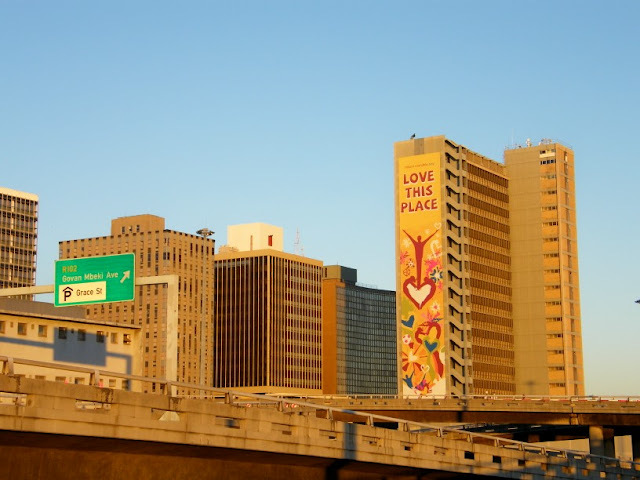 I love Port Elizabeth with a passion and when I pass the building on the freeway and see it, its like a reminder (not that I need reminding) how much I do. Nr 7 Castle Hill is one of the oldest residential houses in Port Elizabeth and was built in 1827. Today the building is a historic museum and is kitted out with furniture and accessories mostly out of the Victorian era. 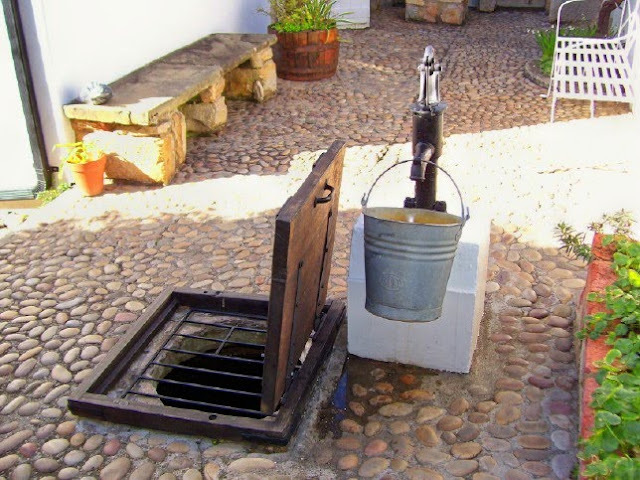 In the back courtyard is the original well which was used my inhabitants of the house which has been restored and is in working order. Singa Lodge is a 5 star boutique guest house in Summerstrand. Name for the mystical dragon-lion of Indonesian mythology the look and feel of the establishment is very different from most other guest houses around town. 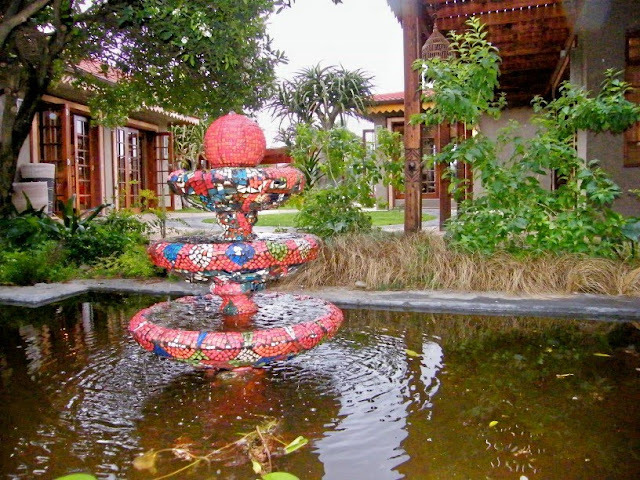 The pic is of the fish pond and fountain in the garden. 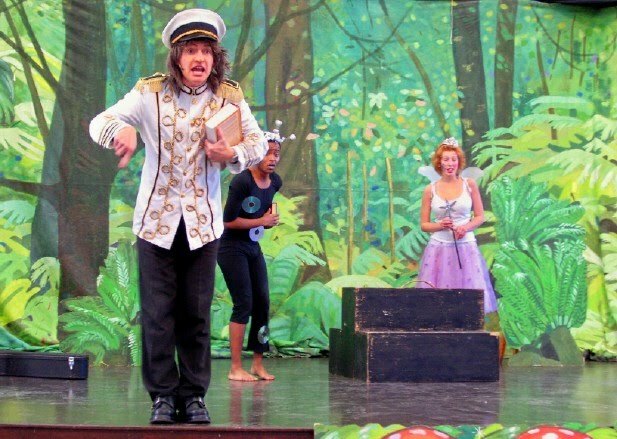 During the school holidays The Boardwalk normally hosts a kiddies pantomime at the Vodacom Amphitheatre. We try to take the Rugrats whenever we can as they love the shows. The Van Staadens River Bridge over the Van Stadens gauge was opened in 1971. 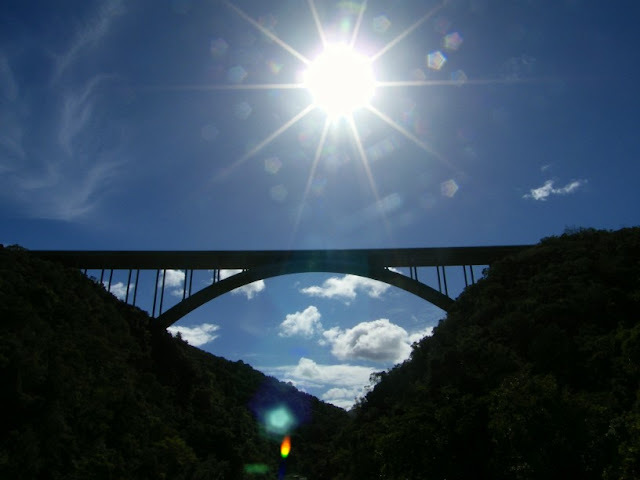 It is one of 5 such arch bridges spanning gauges on the Southern Cape's Garden Route and the most eastern of them. This picture was taken from the bottom of the old pass. For more picture involving craning your neck and looking at the sky, visit Skywatch. Alexandria Coastal Dunefield is the largest, most impressive and least degraded dunefield in South Africa and arguably one of the most spectacular in the world. It comprises an area of approximately 14 000 ha of unvegetated and 1 800 dunes. It stretched for 50 km from Sundays River Mouth to beyond Woody Cape and is 22 km wide on average. 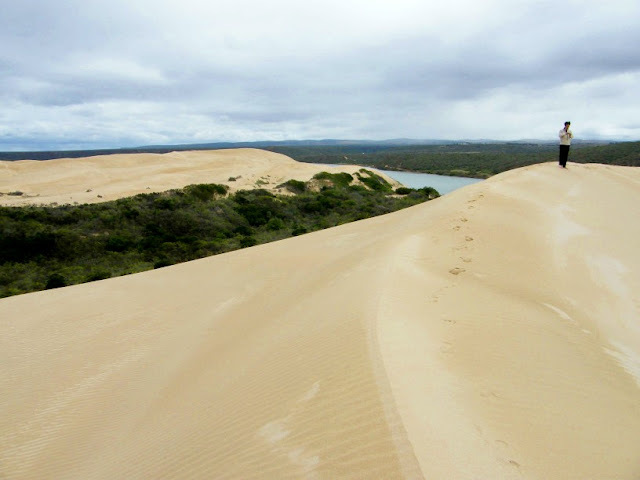 It ranges from 140 meter high dunes right down to the beach and is comprised of bare and vegetated dunes, bush pockets and dune slacks. The dunefield is Holocene (0-10 000 years) in age and thus was initiated during the latter stages of the Postglacial Transgression when sea-level rise from 150m, 18 000 years Before Present. The main transgressive dune field is dominated by a complex array of aklé type reversing transverse dunes. These dunes rise up to a maximum height of 150m above m.s.l. with individual dunes being up to 50 - 60m (crest to base) high. The dunes display both barchanoidal and transverse slipfaces with linking, dominant wind-parallel, across-swale ridges. Portions of the dunefield are well vegetated and indicate periods of relative stability and widespread vegetation within the dunes during the last 10 000 or so years. The Sundays River Ferry sails down the Sundays River from the slipway in Cannonville next to Colchester. 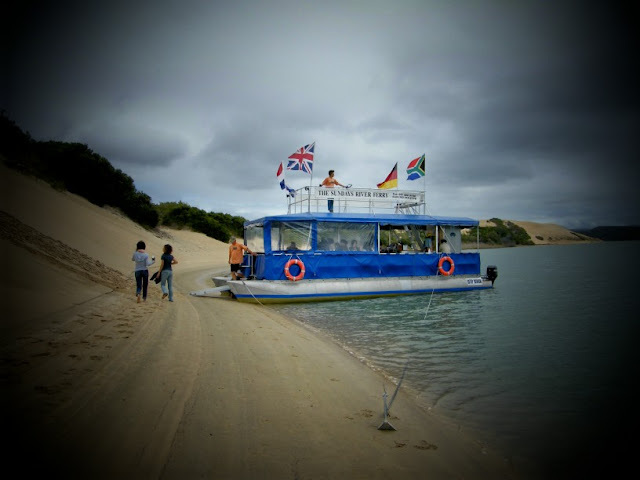 It throws anchor near the Sundays River Mouth so that visitors can climb the giant sand dunes. The dunes are part of the Alexandria Dune Field, the biggest coastal sand dune field in the Southern Hemisphere and the biggest area covered by sand dunes south of the Namib desert. A close-up of the Cape Receife lighthouse which I featured yesterday. 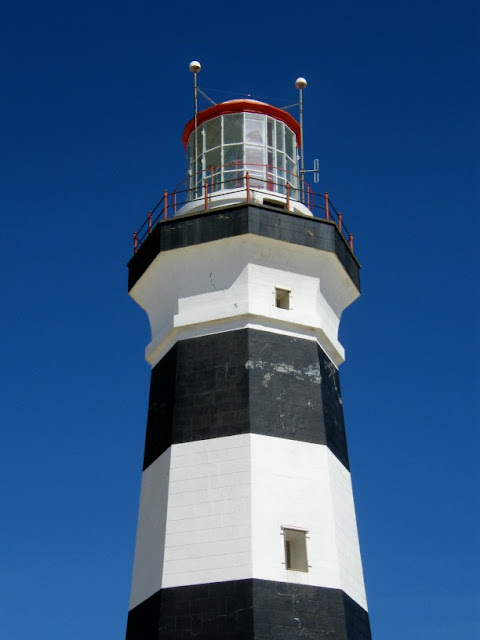 The Cape Recife Lighthouse is situated at Cape Recife, the western point of Algoa Bay. It was built in 1851 and is a 24 meter high octagonal masonry tower. As all lighthouses in South Africa looks different, this one is painted in black and white bands. 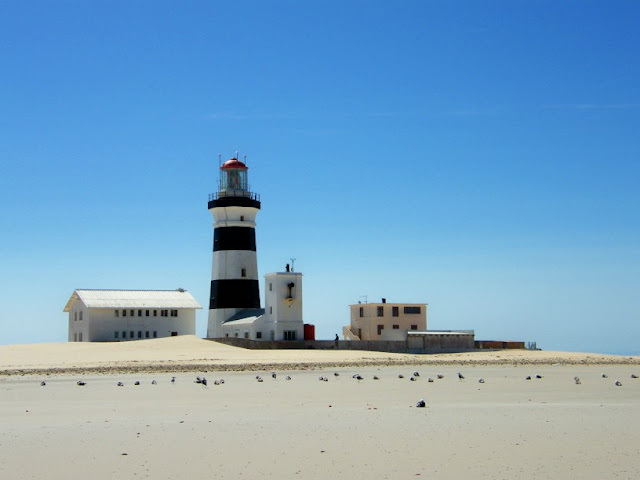 Cape Recife is situated at the southern entrance to Algoa Bay and warns mariners about the dangers which abound in the dark waters. A large spine of rocks known as the Thunderbolt Reef has put paid to numerous ships over the last hundred years. 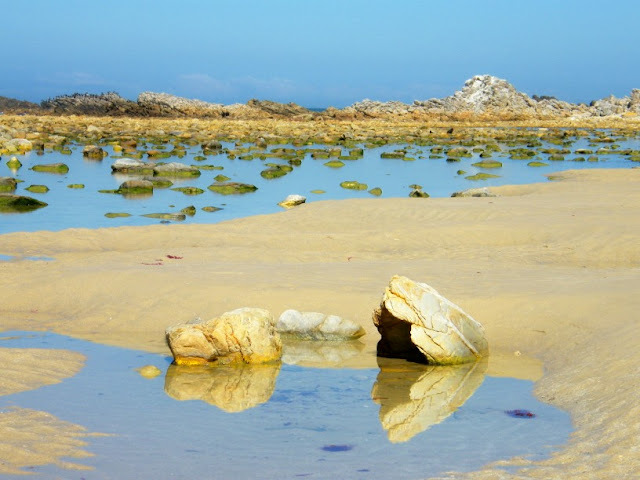 Situated in a nature reserve about 7 miles from Port Elizabeth, Cape Recife witnessed the great gale of 1902, when a hurricane force south easter wrecked countless ships and boats moored in Algoa Bay. This hurricane killed more than 60 people, including six rescuers. The "HMNS Zeepard", which was carrying the explorer, Theunissen was wrecked. As a result of this incident Theunissen made his historical well documented overland trip to Cape Town. Ironically the lighthouse was commissioned on April Fools day in 1851. The initial range of the light was 12 miles, however with the development of technology it is now 29 sea miles. The building is a 24 metre octagonal masonry tower which is built on a rock foundation known as D urban. It is painted with black and white bands equipped with a radio beacon, fog signal, a fixed red light along with a flashing white light every 30 seconds. The establishment of this light came just in time as it saved many lives. The cost of this light in its day was £17 537.10.2 Sterling. 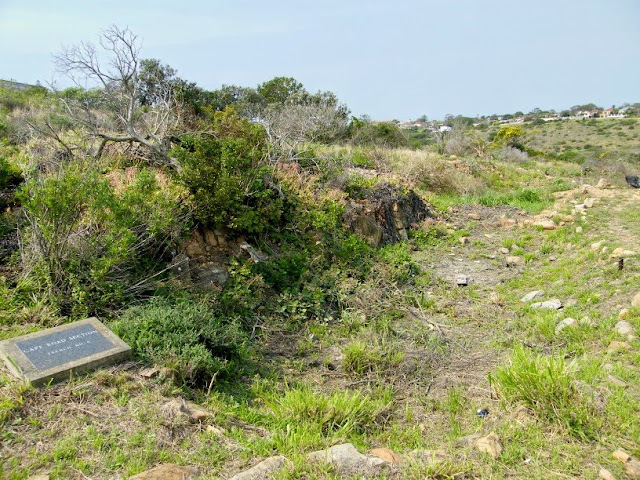 Just above the Settlers Park main car park is a short trail that leads to the remains of a couple of trenches that date back to the Anglo Boer War. A couple of years back when the area was cleared the trenches were rediscovered and the trail was laid out. It was actually found that the trenches was marked on maps of the time. Although the Anglo Boer War (1899 - 1902) didn't take place in Port Elizabeth, the British was concerned that the Boer may decide to invade the city and decided to have trenches dug and fortifications built. Some of those fortifications can still be seen at Van Stadens. Sticking to the Settlers Park theme of the last couple of day. For those who are less energetic or just not in the mood to take the walk down into the park for a picnic; there are some very nice picnic spots right next to the main car park just off How Avenue. Some of them are nice sunny lawn areas where kids can run and play while others are shady spots for those hot summer days we have. This is the view from just above the Settlers Park car park looking west up the Baakens Valley. 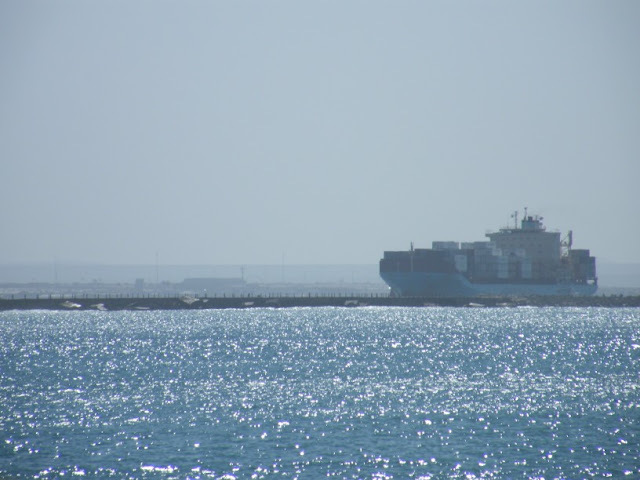 The Baakens River has its origens just west of Port Elizabeth in the foothills of Lady Slipper mountain before flowing through the lenght of the city, entering the sea at the Port Elizabeth harbour. Most of the Baakens River Valley are protected open space of which Settlers Park forms a big part of. The majority of the lenght of the Baakens River can be followed through the city on the (Upper and Lower) Guinea-Fowl Trail. The dirt road in the picture is the path that the trail follows through Settlers Park itself. If you go to the main car park at Settlers Park and look down the cliff you will see Holland Dam. The easiest way to get into the park is to take the tar-surfaced walkway on the right hand side of the car park down into the valley. As you walk down and the buildings on the opposite side of the valley disappears, its hard to believe that you are still in the heart of the city. To get to the dam you have to take a left towards the Bay down at the t-junction. Not long after crossing the stepping stones over the river you will find the Holland Memorial and lecture-theatre, erected in commemoration of the well-known naturalist Fred Holland, on the banks of the dam. It is the ideal spot to sit and have a picnic while listening to the birds calling around you. The 54-hectare tranquil Settler’s Park, which lies along the banks of the Baakens River, is located in the heart of the city. In many ways its the city's green lung. 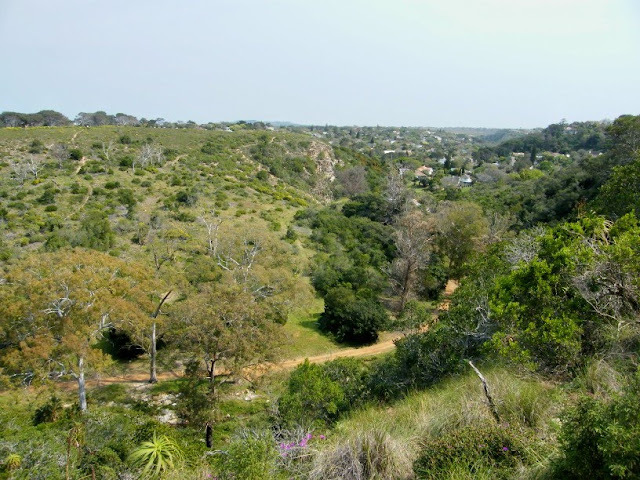 The park has three entrances and may be accessed via How Avenue, just off Park Drive; Chelmsford Avenue, just off Target Kloof or from Third Avenue, Walmer. It also offers recommended short walks that may commence from any of these entrances. 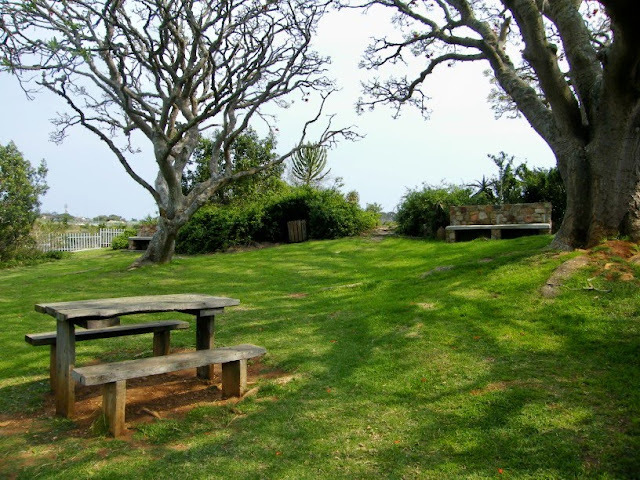 The Park facilities include a flower display house, a Marquette of the 1820 Settlers’ Statue, indigenous flora, rock pools with stepping-stones and grassed areas ideal for picnicking. The Park is rich in bird life, small buck and other fauna as well as offering an 8km walking trail through the Baakens River Valley, named the Guinea Fowl Trail. In the past there has been some unsavoury characters hanging around the park and there were a couple of unfortunate incidents, but the city and its inhabitants have decided to take the park back. The Walk Safe initiative was started as a collaboration between the municipality, various tourism bodies, the police, The Baakens Trust and various nature bodies. This has seen a increase in police and ranger patrols in the valley which is leading to the public slowly returning to this gem of the city. 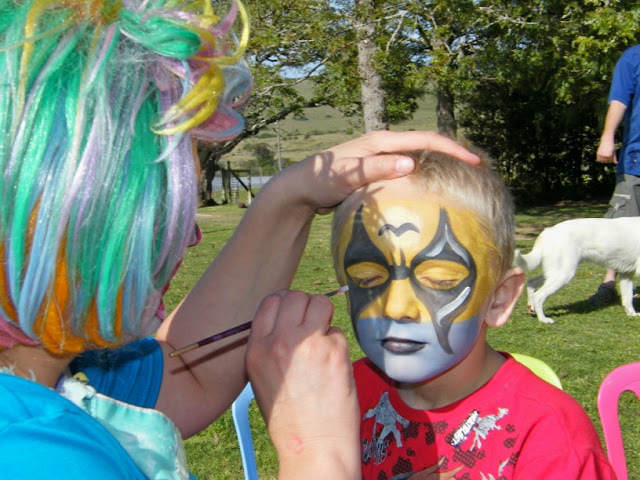 On Saturday we went to the Lake Farm Centre fete and open day. Its such a good cause that one wants to support them as much as possible. Popsi the Clown was there with all her clown friends and amongst others painted the children's faces. I was so surprised when Chaos Boy asked to be made Batman and not Spider Man as he always does. And what a good job she did. Lake Farm Centre has been involved in the care and training of the intellectually disabled since 1959. The Centre was started as a "school" for mentally disabled children with boarding facilities. In 1979 Lake Farm Centre Adult Care was founded as a residential facility with protective workshops. Here training in work-skills i.e. Farming, bakery, hydroponics, pottery, spinning and weaving, home industries, gardening and building maintenance are given. The subsidy of Department of Social Development covers about 30% of their monthly income so they are very reliant on sponsors and fund raising event like this one and the Lake Farm Charity run earlier in the year. Even though I have no involvement or connection to the Lake Farm Centre, I would like to truly thank all volunteers and sponsors for their support of this centre throughout the year. 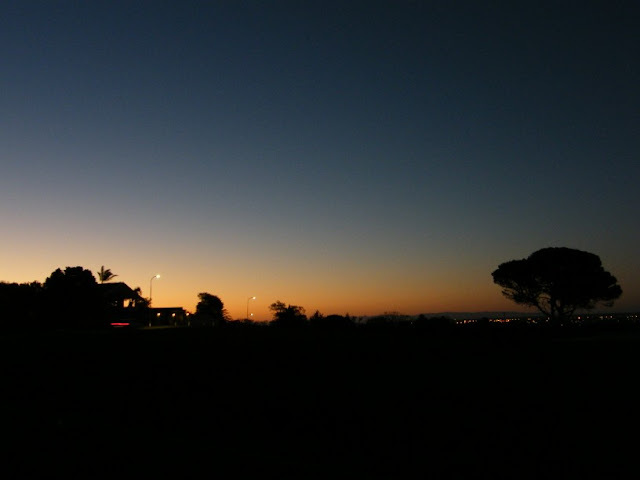 The suburb of Lovemore Heights is one of Port Elizabeth's upmarket suburbs and is probably the highest spot in suburban Port Elizabeth. It has a fantastic view which ever way you look. 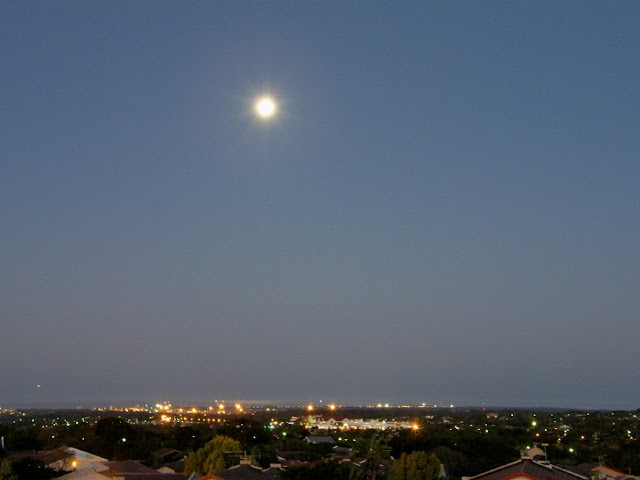 I got this picture looking west just after sunset on the evening I took the pic of the moon rising over Port Elizabeth. I took this pic from on top of the reservoir on Lovemore Heights looking towards Algoa Bay and the beachfront to the east. I received a couple of comments by beedeeboy on the Van Der Kemps Kloof and Van Der Kemps Memorial Church posts I have done before. 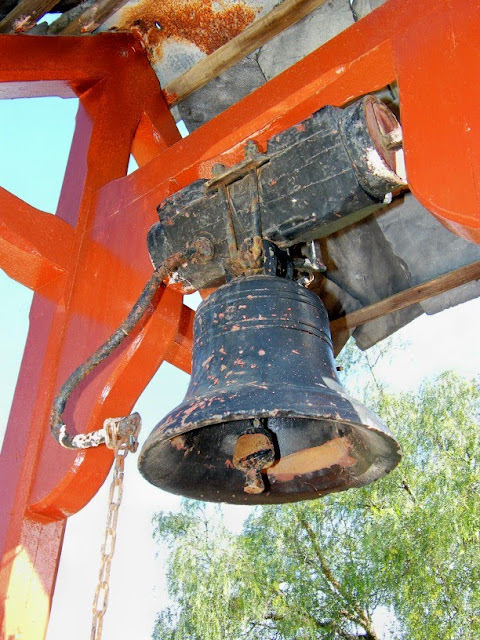 He asked if I had a picture of the old Mission Bell. Well, I went looking and I have one, but I will have to get more next time I'm down that way. The Market Square with the Mission Bell was erected in 1815 in front of the Van Der Kemps Memorial Church which was first built in 1803. Van Der Kemp's Kloof is situated at Bethelsdorp on the northern side of Port Elizabeth. The Kloof is one of six deep, steep-sided valleys cutting into the escarpment in this area. 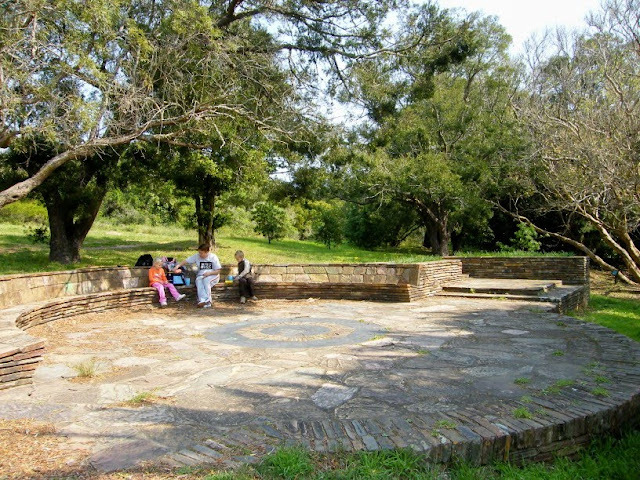 The Van Der Kemp's Kloof Trail is a circular trail and starts at the historic Bethelsdorp Village. The trail is 8km long (three hours) but can be shortened to 4 km. 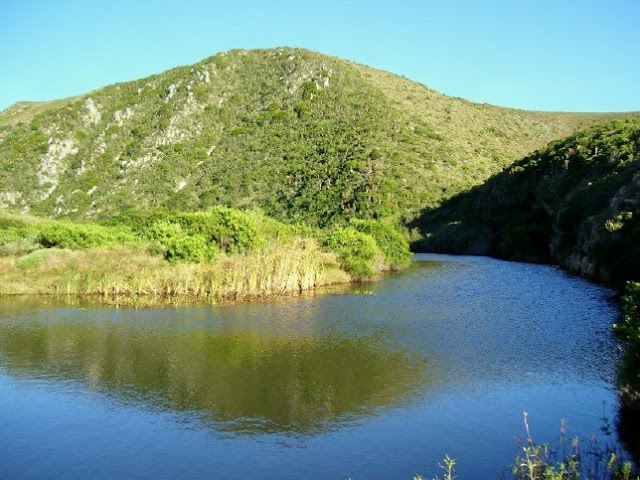 It follows the little Swartkops River into the secluded and scenic Van Der Kemp's Kloof, returning through the grassy fynbos of the Bethelsdorp Commage plateau. From the plateau there are views across to the western suburbs while on the return route there are periodic views of the kloof, and there is an excellent panorama of the Swartkops valley and Algoa Bay prior to the last steep decent into the kloof. The route is marked with red arrows and is suitable for reasonably fit persons. It is advisable to walk in a group, wear stout shoes and take a sunhat and drinking water. Today is the 1st of September which means it SPRING DAY. YAY! Winter is over (even if its only on paper) and everybody is looking forward to summer. 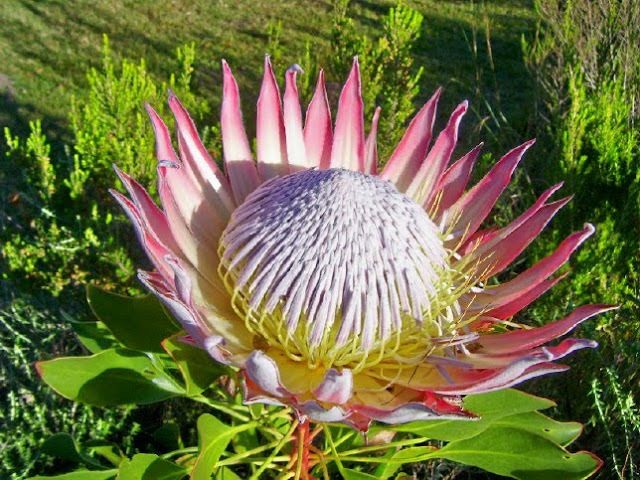 To celebrate the coming of spring I am posting a pic of the King Protea which is South Africa's national flower. And to make it relevant to Port Elizabeth, the picture was taken in the Van Staadens Wildflower Reserve. 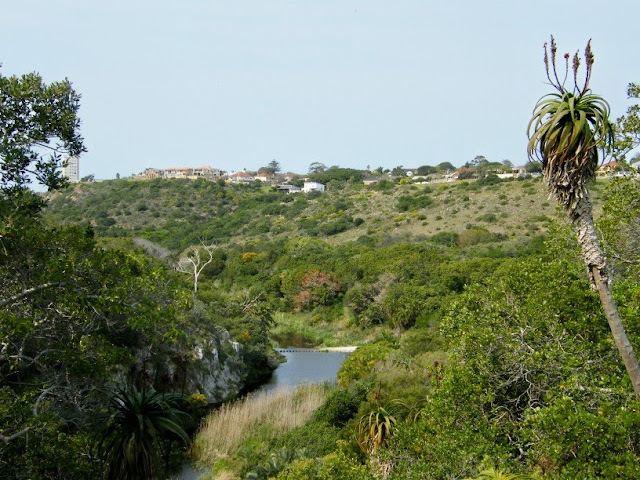 The reserve is about 25 minutes from town and a excellent spot to go and see proteas as well as other Fynbos species as well as a wide variety of birds associated with that type of vegetation.